Azhwar Tirunagari is one of the most important and well known Divya Desams. It is the avatara sthalam of Nammazhwar,home of Perumal Adipiraan(Adinathar) about whom Nammazhwar sung "Ninra Adipiraan nIrka Marraith dheivam naadudhire" meaning "when Adipiraan is standing here why do you have to think of other Gods". This is also a Pancha Kshetram (Adi kshetram, Danta Kshetram, Varaha Kshetram, Sesha Kshetram and Sangara Kshetram). The Lord's feet are buried underground. Indra was cured of a curse after praying here.There is a sannidhi for Varaha perumal Ganapiraan. This place is very famous for the Nammazhwar Brahmotsavam and Garuda Sevai. The Main temple (Adinathar Temple) has a large courtyard and a big tower. Perumal Adipiraan is in Ninra Tirukolam Facing East. There is also a Vigraham of Nammazhwar here which is a bronze image ( a self manifested vigraham) "Tan Uganda Meni". The Sthalavriksham (also known as Thirupuliazhwar) where Nammazhwar meditated for 16 years before his meeting with Madurakavi Azhwar is on the left side of the temple. Theertham - Brahma Theertham, Tamirabarani river. Nammalwar - 3106 - 3116. Features Nammazhwar and Manavaala Mamunigal Avathara Sthalam. Access to the temple Has its own railway station(Tirunelveli-Tiruchendur line). 3 miles east of Sri Vaikuntam. The Moolavar in Aadhinathan. Other names of this perumal are Aadhippiraan, Polindhu Nindra piraan. Moolavar in Nindra Kolam facing east direction. 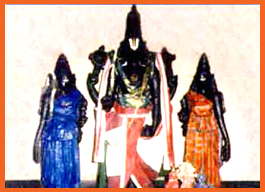 Prathyaksham for Brahmadevar, Madhurakavi Alwar and Nammalwar. Azhwar Tirunagari Railway station is on the Tirunelveli-Thiruchendur railway line. All the passenger trains on this line stop at Azhwar Tirunagari. The Temple is situated about a mile from the Railway station. Buses from Tirunelveli are also available. Facilities for Boarding and Lodging are available and one can conveniently visit the Nava Tirupathis from here.